Uses:- Imipenem/cilastatin (marketed as Primaxin in the USA, and as Cilasafe inIndia) is an antibiotic useful for the treatment of a number of bacterialinfections. 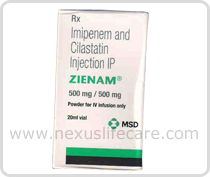 Imipenem/cilastatin is a broad-spectrum beta-lactam containing equal quantities of Imipenem/cilastatin. It is related to the penicillin/cephalosporin family of antibiotics, but is classified as belonging to the carbapenem class.